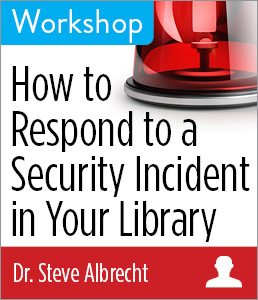 CHICAGO—ALA Publishing eLearning Solutions announces a new session of our popular workshop, How to Respond to a Security Incident in Your Library with Dr. Steve Albrecht. This workshop will last 90 minutes and take place at 2:30pm Eastern/1:30 Central/12:30 Mountain/11:30am Pacific on Tuesday, March 5, 2019. As important as it is to try to prevent library security incidents, it’s not always possible to avoid them, and the way you respond when they happen is crucial. Dr. Steve Albrecht, a security expert and former police officer, will show you how to respond effectively. This session will take the top 10 security, behavior, crime, or emergency-related incidents that occur in libraries and describe the issues, the concerns, and the responses surrounding them. Many of the scenarios will involve challenging or problem-inducing patrons, and others will discuss responses to events that staff might not always know how to deal with properly. Dr. Steve Albrecht, PHR, CPP, BCC, is board certified in HR, security management, and employee coaching. In 1994, he co-wrote Ticking Bombs, one of the first business books on workplace violence. He holds a doctorate in Business Administration, an M.A. in Security Management, a B.S. in Psychology, and a B.A. in English. He worked for the San Diego Police Department from 1984 to 1999 and is the author of 15 books on business, workplace security, and criminal justice topics, including Library Security: Better Communication, Safer Facilities (ALA Editions, 2015).